After an endless torrent of low production zombie flicks shot in forests and abandoned warehouses without even an insincere attempt at color grading to look even remotely professional, we finally have something you can show to that friend who is always resistant to anything in the zombie genre due to it's severe malnutrition of originality. But before you start chomping at the bit, I'm not saying it's great - it's acceptable. Born of something out of the conspiratorial and paranoia inducing French masterpiece Les Revenants, The Cured takes an aging Ellen Page and puts her in Ireland a few years after the zombie outbreaks have been contained and the infected have been "cured." They're not zombies as they didn't die, so we get a 28 days later hybrid where presumably the infected have been subsisting on flesh before they could be "cured" as there's no details on a menu anywhere in this flick. 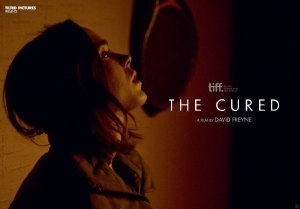 The last wave of the cured, who remember their acts of violence and cannibalism, is about to be released back into a world that doesn't want them. Throw in some violent protests and a zombie rehab, and what we're presented is a depressing view of nightmare laden patients who've been "forgiven" because they weren't in control of their actions. We feel pity for them as we see then being treated like parolees, but that changes as the story unrolls. Page, whose husband died at the hands of the infected, takes in her brother-in-law who is one of the cured, but wait.. he has this strange, almost homosexual attraction between with one of the other rehab patients. While this turns out not to be sexual, it's implications are the driving force behind this film. Their relationship involves the fight for Zombie rights, complete with conspiratorial planning in an environ that looks it should have alcoholics anonymous meetings. Fast forwarding, what we see is the majority of characters and their emotionally burdened staring which is how this film defines itself. It's a character driven drama and the only action, let alone violence, is a mere footnote and plot device. Like the films characters, I don't have much more to say other then it's nither disappointing nor profound.